During the early 1960’s when applications using satellites were in experimental stages even in the United States, the space research activities were initiated in our country. With the live transmission of Tokyo Olympic Games across the Pacific by the American Satellite ‘Syncom-3’ demonstrating the power of communication satellites, Dr Vikram Sarabhai, the founding father of Indian space programme, quickly recognized the benefits of space technologies for India. Since its inception, the Indian space programme has been orchestrated well and had three distinct elements such as satellites for communication and remote sensing, the space transportation system and application programmes. These three are the basics of Indian space research organization. And with its these unique features ISRO made its progress. Mr Alur Seelin Kiran Kumar, appointed as ISRO chairman on January 14, 2015.HE is distinguished APEX scientist and director, space application centre, Ahmedabad. The Indian Space Research Organisation (ISRO) is the space agency of the Government of India headquartered in the city of Bengaluru. Its vision is to "harness space technology for national development while pursuing space science research and planetary exploration. It was Formed in 1969, superseded the erstwhile Indian National Committee for Space Research (INCOSPAR) established in 1962 by the efforts of independent India's first Prime Minister, Jawaharlal Nehru, and his close aide and scientist Vikram Sarabhai. Design and development of launch vehicles satellites and related technologies for providing access to space and for earth observation, communication, navigation, meteorology and space science. Indian National Satellite (INSAT) and Indian Remote Sensing Satellite (IRS) programme for meeting telecommunication, television broadcasting and developmental applications and management of natural resources and monitoring of environment using space based imagery. The Indian National Satellite (INSAT) system is one of the largest domestic communication satellite systems in Asia-Pacific region with nine operational communication satellites placed in Geostationary orbit. Established in 1983 with the commissioning of INSAT-1B, it initiated a major revolution in India’s communications sector and sustained the same later. GSAT-17 joins the constellation of INSAT System consisting 15 operational satellites, namely - INSAT-3A, 3C, 4A, 4B, 4CR and GSAT-6, 7, 8, 9, 10, 12, 14, 15, 16 and 18. GSAT-19 Jun 05, 2017 3136 Kg GSLV Mk III-D1/GSAT-19 Mission GSO Communication Satish Dhawan Space Centre SHAR (SDSC SHAR), Sriharikota. GSAT-9 May 05, 2017 2230 kg GSLV-F09 / GSAT-9 GSO Communication Satish Dhawan Space Centre SHAR (SDSC SHAR), Sriharikota. Except these India has also launched experimental satellites and small satellites. However, these are some major satellites which are very important for not only Indian Space research organization but for the whole of the country. In addition, with its 39 flight (PSLV-C37), successfully launched from Satish Dhawan Space Centre, Sriharikota, ISRO made India in such a responsible position for its latest and new innovation towards a cost cutting strategy that the world will follow India. This was a huge success for India as its first time ever that a country launch so many passenger satellites all together with such minimum cost. ISRO is also planning to launch a new navigation satellite on August 31, 2017. The IRNSS-1H, a navigation satellite, which will replace the IRNSS-1A. 'NavIC' (Navigation with Indian Constellation) was the system that offers services like terrestrial and marine navigation, disaster management, vehicle tracking and fleet management, navigation aide for hikers and travellers, visual and voice navigation for drivers. Navigational Satellite services are emerging satellites based system with commercial and strategic applications. ISRO is working jointly with Airport Authority of India (AAI) in establishing the GPS Aided Geo Augmented Navigation (GAGAN) system. To various uses of positioning, navigation and timing services based on the indigenous system, ISRO is establishing a regional satellite navigation system called Indian Regional Navigation Satellite System (IRNSS). This is a Satellite Based Augmentation System (SBAS) implemented jointly with Airport Authority of India (AAI) and ISRO. The main objectives of GAGAN are to provide navigation services with accuracy and integrity required for civil aviation applications and also better Air Traffic Management over Indian Airspace. The system will be interoperable with other international SBAS systems and provide seamless navigation across various regional boundaries. The GAGAN Signal-In-Space (SIS) is available through GSAT-8 and GSAT-10. Space Segment consists of seven satellites, three satellites in GEO stationary orbit (GEO) and four satellites in Geo Synchronous Orbit (GSO) orbit with the inclination of 29° to the equatorial plane. This constellation of seven satellites was named as "NavIC" (Navigation with Indian Constellation) by the Honourable Prime Minister of India, Mr Narendra Modi and dedicated to the Nation on the occasion of the successful launch of IRNSS-1G, the seventh and last satellite of NavIC. ISRO, tie-up with BHEL to help for developing low-cost lithium ion batteries for electric vehicle and foresee a buyback commitment for such batteries. Indian Railways tie up with ISRO to get online satellite images for improving safety and enhancing efficiency. The geospatial services will be available from satellite-assisted navigational support by its GPS aided geo augmented navigation (GAGAN) system. For promoting space research related activities among students, Indian Space Research Organisation (ISRO), Ahmedabad has collaborated with the Space Applications Centre (SAC) Institute. The European Space Agency, which had collaborated with ISRO during the Chandrayaan I mission. Maharashtra Forest Department tie up with Indian Space Research Organisation (ISRO) to track the mangrove destruction through real-time satellite imagery, first time in India. Gujarat Cooperative Milk Marketing Federation (GCMMF)(Amul) tie up with Indian Space Research Organisation (ISRO) for fodder acreage assessment which will benefit the dairy farmers by using satellite observation and space technology,. L&T and Bharat Forge to tie-up with DRDO and ISRO for materializing several key projects. Russia-based satellite navigation player NIS GLONASS also signed a Memorandum of Understanding with the Indian Space Research Organization (ISRO). Andhra Pradesh state government tie up with ISRO to get latest weather information to support farmers. Russian tie-up to boost ISRO's semi cryogenic launcher plan. Hindustan Aeronautics Limited (HAL) and Indian Space Research Organisation (ISRO) will tie up to work on manufacturing the integrated cryogenic engine. Earlier, HAL had partnered with ISRO throughout its journey by providing hardware for satellites. Telangana to tie up with ISRO for water resources info system, which will keep eye from sky on state's water resources also ISRO updates the system with new satellite imagery of all water bodies every fortnight. ISRO and Japan Aerospace Exploration Agency (JAXA) sign MOU for a corporation in the field of outer space. ISRO & Jet Propulsion Laboratory (JPL), NASA are jointly working on the development of Dual Frequency (L & S band) Synthetic Aperture Radar Imaging Satellite named as NASA-ISRO Synthetic Aperture Radar (NISAR). 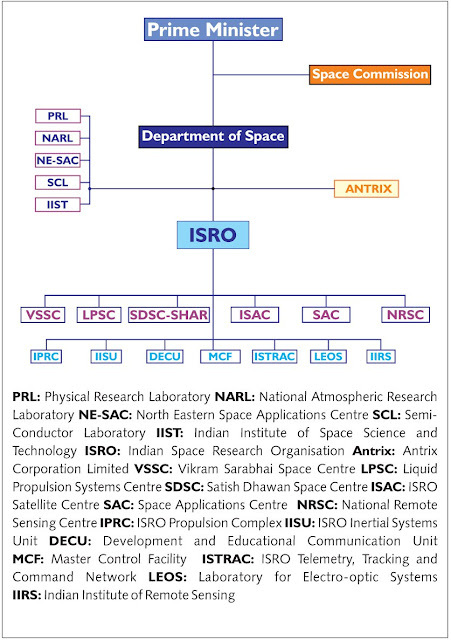 The Indian Space Research Organisation (ISRO) mainly known for its cost-effective space missions which make it in a distinctive position than others. Its knack for frugal engineering and adaptive technology with the changing market has made the ISRO stand out in the world. With its new landmark journey into a new era of space application, India on July 1, 2013 ISRO successfully launched its first dedicated navigation satellite using the Polar Satellite Launch Vehicle which blasted off from the Satish Dhawan Space Centre named as IRNSS for Indian Regional Navigation Satellite System which is one of the few navigation systems in the world and will provide an alternative to systems like the GPS (global positioning system) . IRNSS consists of seven satellites out of which three are in geostationary orbit and four are in inclined geosynchronous orbit, and will mainly cover the area around India for its operation. On September 29, 2012, from Ariane-5 rocket from Europe’s spacecraft in French Guiana in South America India launched its advanced communication satellite GSAT-10 Weighing 3400 kg at lift-off carry 30 communication transponders in normal C-band, lower extended C-band and Ku-band as well as a GPS Aided GEO Augmented Navigation (GAGAN) that is meant to augment telecommunication, direct-to-home broadcasting and radio navigation services. It will also help in accurately pointing ground antennas towards the satellite. On September 9, 2012, ISRO's Polar Satellite Launch Vehicle, PSLV-C21 successfully launched SPOT 6 and PROITERES from Sriharikota, which carried two foreign satellites - SPOT 6, a French satellite and a Japanese micro satellite called Portieres. As ISRO is always famous with its cost affecting missions on April 26, 2012, PSLV-C19 successfully launched India's radar imaging satellite which approved cost of RISAT-1, including its development, was Rs 378 crore, while Rs 120 crore has been spent to build the rocket (PSLV-C19) itself, making it a Rs 498-crore mission only. Radar Satellite-1 (RISAT-1) is Microwave Remote Sensing Satellite carrying a Synthetic Aperture Radar (SAR). India successfully launched its first mission to Mars named as MARS ORBITER MISSION or MOM on board PSLV C25 from Satish Dhawan Space Centre (ISRO) at Sriharikota in Andhra Pradesh on 5th November 2013. The mission was expected to reach Mars orbit by September 24, 2014. With its new cost affecting technology ISRO successfully launched its PSLV-C37, ISRO has pushed a whopping 104 satellites into orbit and made a new world record on February 15, 2017. If India has to play a pivotal role in global satellite industry then it will definitely need bigger and heavier rockets to launch heavier payloads into space. The Geosynchronous Satellite Launch Vehicle Mark III, referred to as the Launch Vehicle Mark 3, LVM3 or GSLV-III is a launch vehicle developed by ISRO itself. It has a capacity to lift up to 4 tonnes into GTO (Geosynchronous Transfer Orbit – where all the communication satellites have to reach to reach the 36,000 km circular orbit). The next GSAT-19 is planned as the payload for the first developmental flight of the indigenous GSLV-Mk III-D1 Launcher which as of now the launch is planned in April 2017. Mk III can loft satellites weighing 4,000 kg to space.The next step after Mk III though will be able to lift 6.5 tonnes. The Mk3 will form the basis for the launch vehicle which will use four instead of two S200 solid rocket boosters, currently the second most powerful solid rockets in the world. India is planning to launch Chandrayaan-2 by 2018. It will pick up soil or rock samples for on-site chemical analysis, the data will be relayed to Earth through the Chandrayaan-2 orbiter. It is an advanced version of the previous Chandrayaan-1 mission. It consists of an Orbiter, Lander and Rover configuration. A mission to the Sun by ISRO the year 2019-20 – is named as Aditya-1. Which is India’s first Solar Coronagraph to study solar Corona in visible and near IR bands. The launch of the Aditya mission was planned in 2012 but was postponed due to some extensive work involved in the fabrication and other technical aspects of ISRO. The Aditya-1 mission was conceived as a 400kg class satellite carrying one payload, the Visible Emission Line Coronagraph (VELC) and to launch in an 800 km low earth orbit. The main objective of this project is to study the Coronal Mass Ejection (CME) and consequently the crucial physical parameters for space weather such as the coronal magnetic field structures, the evolution of the coronal magnetic field etc. The Indian Manned Spaceflight programme is a proposal by ISRO to develop and launch a two-person crew to low Earth orbit by 2021. The human spaceflight will occur after 2017, on a GSLV-Mk III, as the mission is not included in the government’s 12th five-year plan (2012–2017). While Russia, USA and China being the only countries to have successfully conducted human space flight programmes, with this new programme the scientists were hoping to make India the fourth. These are some recent and upcoming projects of ISRO, hoping to place India in a world ranking position, where our country can lead the whole world.